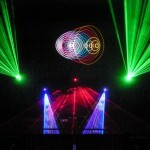 Indoor Laser Shows | Laser Spectacles, Inc. 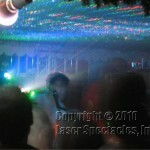 It has been a few years since we were at the Zoolu party, which was a fixture in Laser Spectacles schedule for quite a few years. 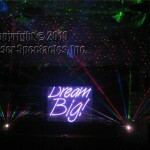 In 2012 we were back adding lasers once again to this world renowned celebration! 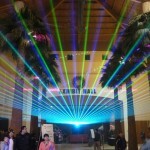 Laser Spectacles fired on all laser cylinders at the stage known as “Neon Garden” in the Automobile Building, Fair Park, Dallas on June 18, 2011. 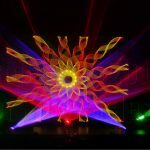 We created a special laser stage, working with Onstage Systems from Dallas to create special low level lighting that showed the lasers to best effect. 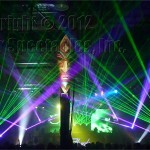 The promoters, Insomniac, expected it to be up to 20,000, almost twice as big as last year’s event at fair park. 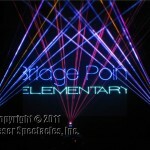 Laser Spectacles, Inc. provided the “Main Event” for Bridge Point Elementary’s “Science Day” on Jan. 28, 2011 in Austin, TX. 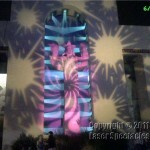 Four laser shows were performed between 8:45 and 11:30 AM. 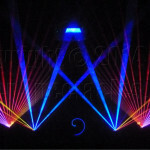 Laser Spectacles, Inc. has performed many times for the Texas School for the Deaf over the years, especially at the Christmas holiday farewell party.